Transcriber’s note: Eliakum Zunser (1836-1913) (known popularly as Lyokumkhe Badkhan) was arguably the greatest badkhan (wedding jester) who ever lived. Although his life was full of tragedy (orphaned, apprenticed to a man who sold him into Nicholas’ army from which he narrowly escaped, one child devoured by a wolf, 4 children died of cholera, and his wife died young) he somehow grew into the most popular Yiddish poet and entertainer of his time. He was known throughout Eastern Europe even though there were no Yiddish newspapers, recordings, or media. People would set his poems to other melodies and use his melodies for other poems. It is said that at his 50th birthday banquet he delivered an address in rhyme that lasted over an hour. 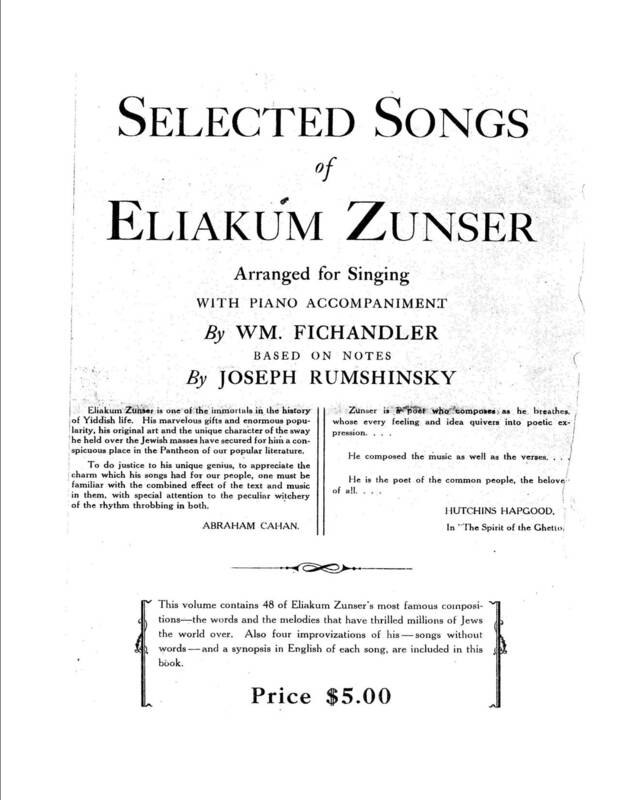 A Zionist youth group he started in Minsk , Eliakum’s Circle, would entertain themselves occasionally by shouting out random topics with Zunser composing poetry spontaneously as he heard the words shouted. When he would entertain at a wedding people would crowd the doorways and windows hoping to hear his songs and poetry. Zunser’s Footnote: Di shpil fun shtok vert geshpilt oyf azoy an of’n. Es vert avekgeshtelt in mitn shtub shtuln: eyn shtul mit dem parentsch rekhts, der tsveyter—links. Etlikher zetst zikh oyf a shtul. Tsum bayshpil, tsen shtuln—zitsn tsen mentshn. An eltster mentsh geyt mid dem shtok arum di shtuln. Bay vemn er klapt on mit dem shtok, yener shteyt oyf un geyt im nokh biz aleh 10 mentshn geyn nokh im. Plutzlung zetst er zikh oyf a shtul, muzn zikh aleh zetsn oyf shtuln; un vayl er farnemt oykh a shtul, derum muz er eyner blaybn on a shtul. Den vert yener strafirt un muz geyn mitn shtok. The staff (stick) game was often played this way. They would put chairs in the middle of the room: one chair with the rails (chair back) to the right, the second to the left. Each person sits on a chair. At the beginning, 10 chairs—with 10 people on them. An older person walks with the staff around the chairs. When he taps the staff on the ground in front of someone, that person stands up and follows him, and so on until all 10 people are following him. Suddenly the leader sits down on a chair, and all the others must sit down, too; and because the leader also takes a chair, someone will be left without a chair. The one left out is penalized and must now walk with the stick. Transcriber’s note: Zunser implies that this game was well known before he wrote his song which is more or less a tongue-in-cheek ode to the staff game that begins with a description of how its players feel as they play it and, in Zunser’s classic style, it then compares the game to an aspect of life, in this case in which some do well and some go hungry (e.g. “The chairs are the days of the world, with the staff marches time. Luck and misfortune, poverty and wealth dance along beside.) And, as he often does, Zunser gives some advice, too (e.g. don’t get too proud when times are good, don’t cry “vey” when times are bad. From luck to misfortune isn’t too far, just a turn of the chair.) Zunser published the music for the song. I learned the song from my bubbe, Sarah Benjamin (1890-1981), who learned it as a young woman in Belarus . Az mehot zayn ort fakhapt? Zet, ir blaybt on broyt! Dem tsveytn zetst zi aruf. Pui, dos iz nit sheyn!